The moment that I walked through the Rietberg’s green glass doors (you can find an earlier post about the art museum here), this giraffe beckoned to me. Its vibrant beadwork and simplified form grabbed my attention again as I was leaving the museum. Then, it followed me home. The only information available about this beaded artwork is that it was made in Africa. Curious to know more about the history of beading in Africa, I did a bit of googling. Of course, this called for a new Pinterest board, one dedicated to African beadwork. Known historical references indicate the use of beads as a medium of ornamentation and communication dates back thousands of years among the people of Africa. While ostrich eggshells are among the earliest materials used in African beadwork, glass beads are used extensively today. Maasai women wearing colourfully beaded collar necklaces (source). 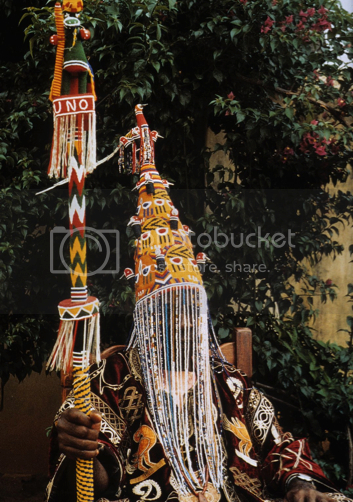 Yoruba beaded crown and divination tapper (source). Sadly, much of the history of glass beads in Africa is rooted in exploitation. Today, one non-profit working to develop beading as both a viable source of employment for its artists and to fund community projects in South Africa is Monkeybiz. Artworks created by the artists working with Monkeybiz are available in shops around the world. They can also be purchased directly from the organization via their website. As I look at the wonderful beaded giraffe that followed me home, I wonder about the person who made it. Who is she or he? Where in Africa are they from? What is their daily life like? What motivated them to use the patterns and colours selected for this piece? What do they dream of? And wish to thank the artist for making it. Photographs: 1 & 2 by Sara Lynne Moffatt (my first time using a prime lens and manual settings, I’m now hooked 🙂 ), others as per the links found in the captions. This entry was posted in Africa, Art, Artists & Artisans and tagged Africa, Beadwork, Monkeybiz, photography on April 24, 2014 by Sara. He he, I remember these beaded souvenirs when I visited South Africa some time ago. I remember bringing back these cute little dolls made of beads looking exactly like in your photographs. I gave them all to my friends, though and didn’t keep any for myself. 🙂 Cheers. How nice for your friends and what a great visit it must have been. South Africa is on my travel radar, as is Morocco. The mysterious kasbah that you photographed in Morocco looks pretty cool.